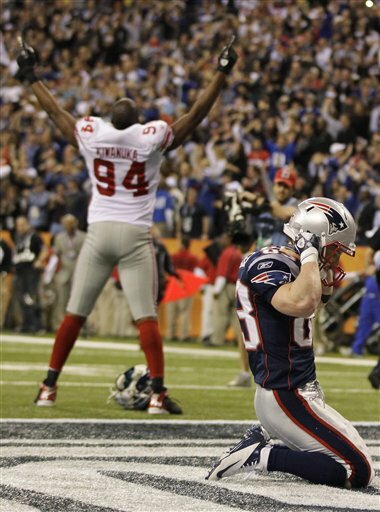 The Giants defense in Super Bowl 46 was fascinating, on many levels. Let’s start with personnel. As expected, the Giants featured package was the “big nickel”, with 3 safeties, Antrel Rolle, Deon Grant and Kenny Phillips. In fact, all 3 played every snap but one. What surprised me was the extensive utilization of Chase Blackburn. I had anticipated that Blackburn, despite his solid play as the starting middle linebacker over the last 2 months, would not be on the field as much against the Patriots 2 tight end pass game. I felt his overall lack of athleticism and range would be a negative. I was wrong. Blackburn played about 40 snaps, and he played well. The 2 players who did not play as much as I had expected were Mathias Kiwanuka and Jacquian Williams. Kiwanuka rarely came off the field in the first matchup versus the Patriots back in early November. In Super Bowl 46, he was a situational player. The same was true of Williams. It was Williams whom I believed would play significant snaps. He’s quick and athletic and had been used throughout the season to play man-to-man against tight ends. 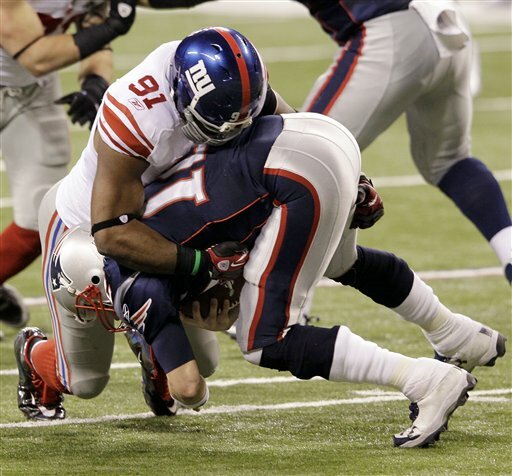 Blackburn, who was not on the Giants roster in the first Patriots matchup, took snaps away from both. Giants’ defensive coordinator Perry Fewell clearly saw it differently than I did, and he knows his players a lot better than I do. As I watched the film, the Giants strategic template became evident. I noticed that Fewell’s underlying foundation derived from a number of basic premises, all the result of understanding Patriots tendencies throughout the season. First, the Patriots did not possess a vertical receiving threat. Second, Tom Brady did not throw the ball outside the numbers very often. You rarely saw isolation routes on the perimeter, with any receiver working one-on-one against a corner. Lastly, there were few plays in which Brady took 7 step drops. Almost everything was 3 step and 5 step; the rhythm was quick, and the ball was delivered on time. Keep in mind, preparation and game planning is based on tendency and probability. The focus for Fewell became defending the middle of the field: between the numbers, in the short to intermediate areas. Just as important, it was essential to take away the quick throws, the timing throws, the throws that came early in the down, within the first 2 seconds. Here’s what stood out watching the tape: the Giants predominantly showed a 2 deep safety shell before the snap, then rotated at the snap to single high safety looks. It was a simple but effective concept against Brady, whose best attribute may be his ability to beat defenses in the pre snap phase. By winning mentally before the snap, Brady has been able to win consistently early in the down. Quick, accurate throws to the right receiver. That’s been a trademark of Brady’s greatness. The Giants mixed and matched coverage schemes beautifully. They utilized bracket concepts between the numbers, in-and-out man concepts, matchup zone principles, straight man-to-man. They were patient and disciplined. That really stood out against play action. The flash play fakes that normally create just a moment of hesitation for the underneath defenders did not impact the Giants at all. Coverage was not compromised. The Giants won early in the down. There were few rhythmic throws, little sense of timing to the Patriots passing game. They forced Brady to play late into the down, and that’s not when he’s at his best. What was really interesting was the depth of New York’s safeties. They played very shallow. They were never concerned about getting beaten over the top. A 3rd and 8 play in the third quarter was very telling. Safeties Deon Grant and Kenny Phillips both squatted at 10 yards; you never see that on third and long in the NFL. Brady had no throw either early or late in that down. 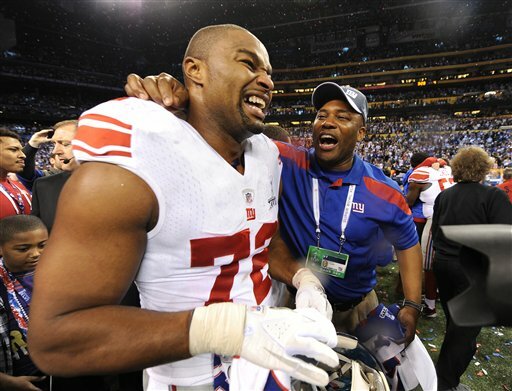 As a result, he was sacked by Justin Tuck. 2 other plays in the third quarter also spoke volumes about the Giants approach. Both were designed to get the ball to Rob Gronkowski. The first was the opening play of the second half. The result was a positive for the Patriots. It was Brady’s best play of the game, 21 yards to Chad Ochocinco (the Patriots longest play) on a deep comeback late in the down. The play was designed, however, to get the ball to Gronkowski down the seam off flash play action. Jason Pierre-Paul held up Gronkowski off the line. That removed Gronkowski from the equation. I had seen Pierre-Paul do that this season with Jason Witten a number of times. Later in the third quarter, it happened again. Pierre-Paul rode Gronkowski hard to the outside, not allowing the tight end to get off the line of scrimmage cleanly. Brady was forced to extend late into the down, and threw an incompletion. Two plays specifically called for Gronkowski down the seam, both taken away by Pierre-Paul at the line of scrimmage. The Giants game plan was boldly conceived, and well executed. Fewell brilliantly recognized the strengths and limitations of the Patriots passing game. It was an outstanding defensive performance.